These days, a great emphasis is made on teaching and using the Reiki symbols. They have traditionally been seen as the integral part of the Reiki training. For many, the symbols are akin to the keys that open the doors to Reiki, the universal source of energy; and these symbols are more of an aid to make a connection between the intent and the subtle energy. Dr. Mikao Usui was neither given a formal training or attunement nor was he “taught” the symbols. He gained this knowledge by his continuous urge to “seek” and was rewarded by it as a result of the meditation that he did. But it would be wrong to say that he did not use the symbols. These symbols came to him in the sudden burst that followed the “enlightenment”. The Reiki symbols have evolved over a period of time as various Reiki practitioners continue their journey to seek the best results for greater good of the universe. In a practical sense, the symbols are meant for the benefit of many students who have difficulty in focusing without an aid. Dr. Mikao Usui introduced them in his technique of practicing Reiki precisely for making it easy to focus and pass Reiki. 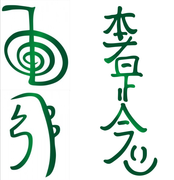 Dr. Mikao Usui intuitively viewed these Reiki symbols as a divine “message” or the “key” and when he chose them based on the explosion of ball of bright light forming patterns. He intuitively realized that they would, in some way, represent the various facets of the divine Reiki energy. While these additional symbols can safely be ignored, I personally feel that the traditional symbols do help in focusing; for e.g. Hon-Sa-Za-She-Nen does help in forming a “connection”. Therefore, I would say that there is no harm using them. However, the need for using these or any Reiki symbols should be as per one’s personal belief and preferences. During Reiki training and attunement there is certainly a need to impart the knowledge about these symbols; thereafter the use should be left to an individual’s own choice. Some of the later Reiki practitioners introduced more symbols subsequently, mostly for personal monitory games and egoistic satisfaction of naming various arms of the divine healing practices after their own name and “selling” Reiki. These have no place in Usui Reiki. But the symbols handed down thru Usui linage can be, and should be used as divine tools that unlock the energy fields and help in healing as well as attainment of goals. Some of us do not use Reiki symbols as we feel that the intent to send the healing is adequate for the divine Reiki energy to start working. At the same time, during the healing sessions (as well as during attunements) I personally find that they can give miraculous results! Hence, if you ask me, do use them at least initially, because all of us are not naturally blessed with high amount of intuitiveness and these symbols help us in developing our techniques. In the final analysis – Reiki symbols cannot cause any harm; and may only cause some good, so why not use them? But, if you do use them, do it with full faith. You will surely find some Reiki centre or a practitioner near you. In case you don’t, you can take on my online Skype course in which I will teach you face to face … But that’s only as last resort. I will send you the Hindi translation. What’s your email address?